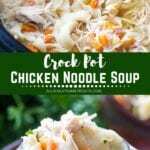 A delicious, hearty, comforting Crockpot Chicken Noodle Soup! Once you make this easy homemade soup recipe you won’t go back to a can of soup. I love warming up with a big bowl of chicken noodle soup on cold winter day or when I’m feeling under the weather. 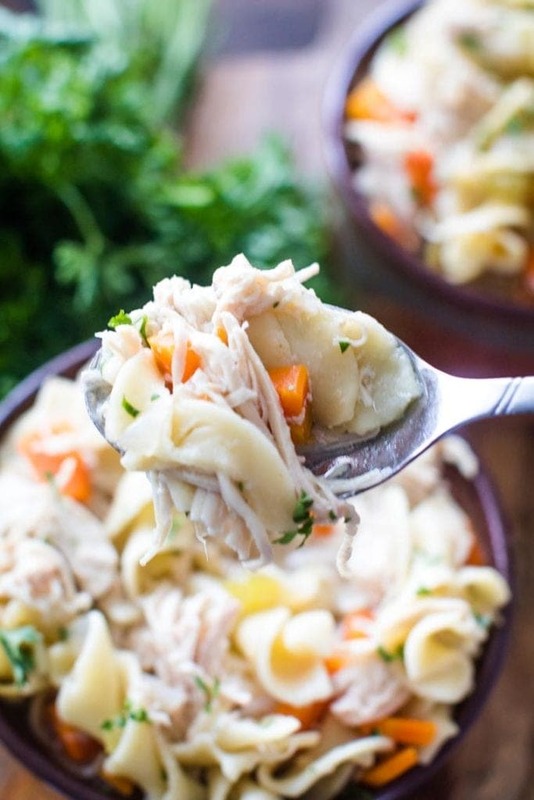 This slow cooker chicken noodle soup is amazing and a family favorite. It’s the BEST! Has everyone around you been sick lately or is it just our house? Of course because everyone is so well mannered we’ve been sharing…. and sharing. The kids had it first sharing it with each other. Then it was my turn. Then Jason got it. I’m praying we are done now and crossing my fingers! Seriously? This year it has been really tough! I’ve been making soup like no one’s business! First it was Creamy Chicken Noodle Soup then Homemade Chicken Pot Pie Soup. Most recently I made Slow Cooker King Ranch Chicken Soup because I was dying for some spice! There’s something so warm and comforting about a great bowl of soup, wouldn’t you agree? Cold snowy days and even colder nights, Crockpot Chicken Noodle Soup is the perfect meal! Plus, who doesn’t love a recipe you can let cook all day long in your slow cooker? I love it for those busy nights when the kids have activities and we are darting from one thing to another. If you don’t have all day make sure to check out this Instant Pot Chicken Noodle Soup! 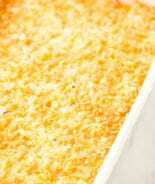 Some nights I just don’t want to cook either, so this is the perfect recipe to make then. If I know Jason or I will be gone one night and alone with the kiddos I like to make a Crock Pot dinner so we don’t have to try and make dinner plus entertain the kids solo. What spices are good in chicken noodle soup? I keep the spices really simple with this soup using just bay leaves and thyme. Thyme and chicken is the perfect combination and brings out the best flavors when used together. 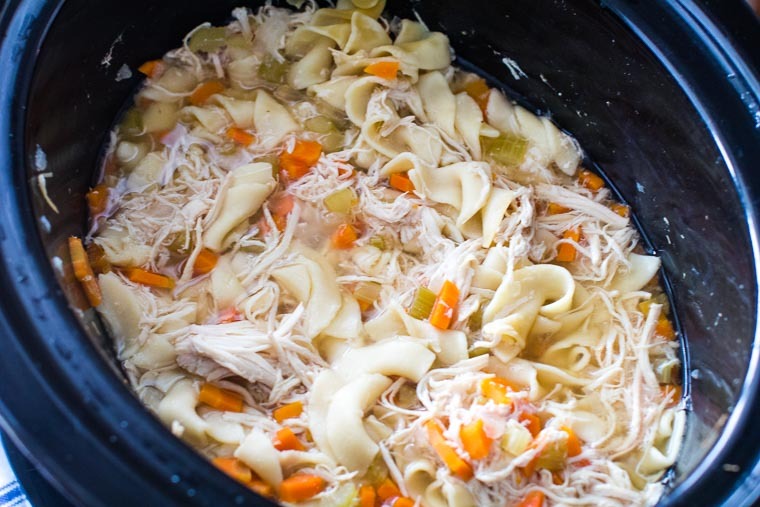 Why is Slow Cooker Chicken Noodle Soup good for you? The wonderful thing about this soup is it’s packed with vegetables and protein and that’s what makes it good for you! Filled with delicious broth shredded chicken it’s guaranteed to fix whatever ails you! When maybe that’s a stretch, but this soup is definitely my go-to meal in the fall and winter! 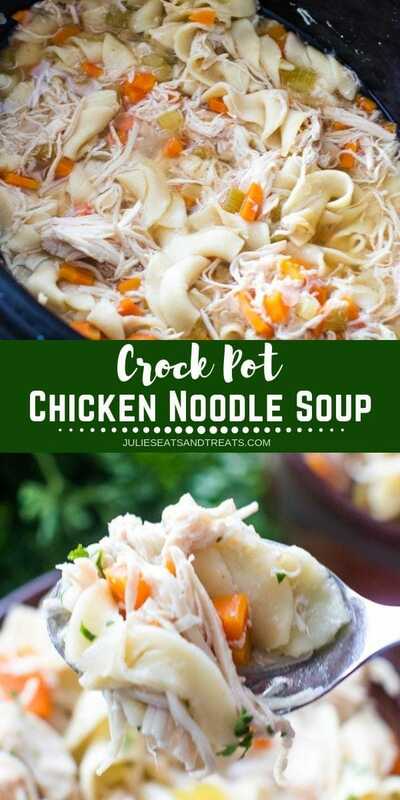 Another great thing about the Crockpot Chicken Noodle Soup is that it makes a big batch so you can have friends and family over, share some with neighbors or it’s perfect for leftovers. Can’t beat having a warm bowl of soup for lunch at work! Sometimes the noodles soak up the broth when you refrigerate it. 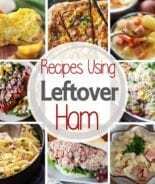 Just add a little water or chicken broth to leftovers! Peel and dice the onion and carrots. Add the chicken breast, onion, carrots, celery, garlic, thyme, bay leaves and chicken stock to the slow cooker. After six hours, remove the chicken breast and shred it well. Add the chicken back into the cooker. Cook on low an additional 30 minutes or until noodles are cooked through. A squeeze of lemon and some diced parsley at the end is an easy addition that will brighten the flavors of this delicious soup! 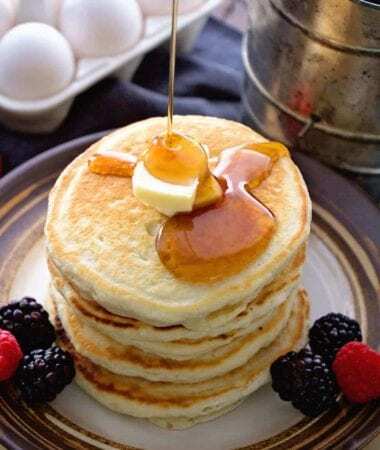 This is a wonderful meal that is sure to please everyone in your family! Love your crockpot? Here are more great soups to enjoy! 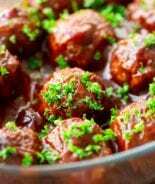 And if you’re looking for more Easy Crock Pot Meals – click here! Here’s hoping your family stays healthy and happy this season! If not, you know what to do! I know you’ll love this easy soup. 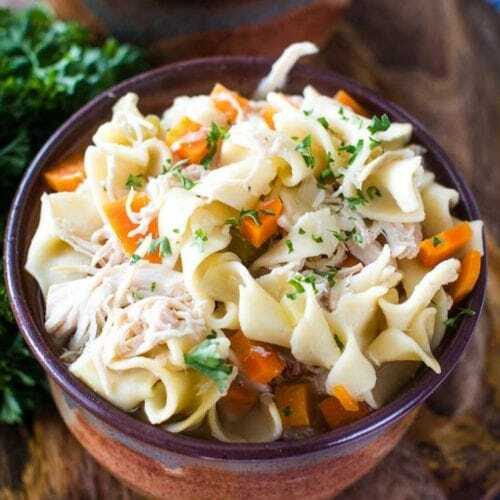 Be sure and comment below with a five-star rating when you make this easy Slow Cooker Chicken Noodle Soup! 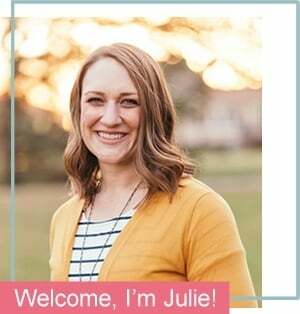 Tag me when you make it @julieseatsandtreats or #julieseatsandtreats. Enjoy! Warm up with a big bowl of homemade Crockpot Chicken Noodle Soup tonight! 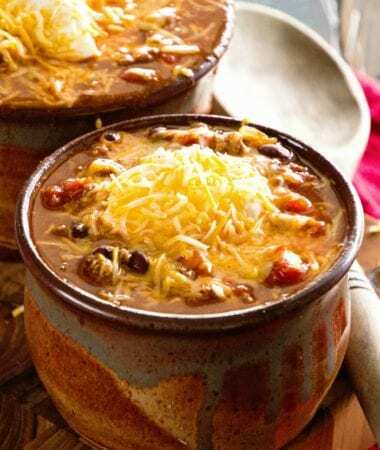 This hearty soup recipe is made in your slow cooker and so easy! Add chicken, onion, carrots, celery, garlic, thyme, bay leaves and chicken stock to crock pot. Cover and cook on low for 6 hours. 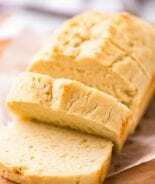 Remove the cooked chicken breast and shred using two forks. Add the chicken back into the cooker along with the egg noodles. Cook on low an additional 30 minutes or until noodles are cooked through. Serve immediately! 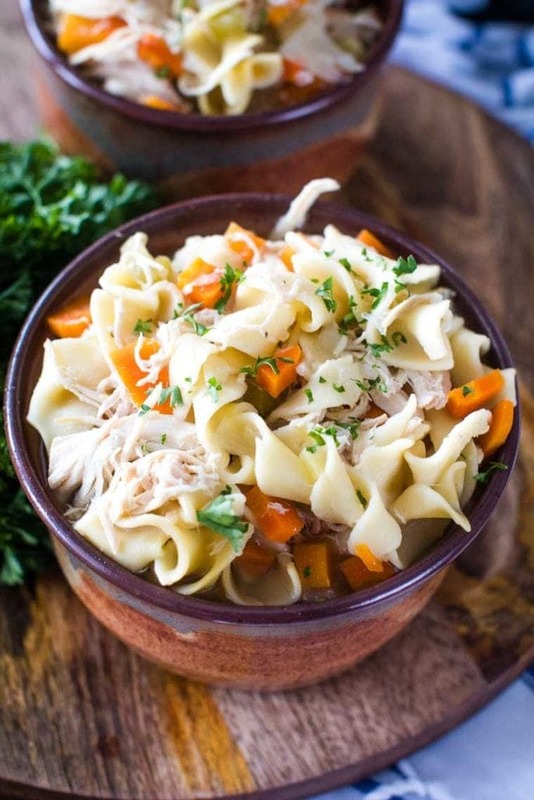 This slow cooker chicken noodle soup looks absolutely delicious! So delicious during the winter! Now I can’t decide which one to make! This one, or your creamy chicken noodle soup! 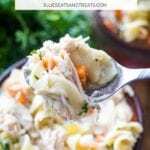 I love this slow cooker chicken noodle soup!! It’s on the menu frequently during these cold snaps!! 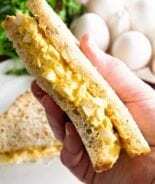 It’s a go-to recipe here too!